Brother Charles O’Leary, an Irishman but a true Sabahan at heart! Kota Kinabalu: The passing of La Salle Brother Datuk Charles O’Leary once again poses the calling for Sabahans, especially from Tanjung Aru’s La Salle School, to take up the vocation of being a La Salle Order of Teachers Brother. Bro. 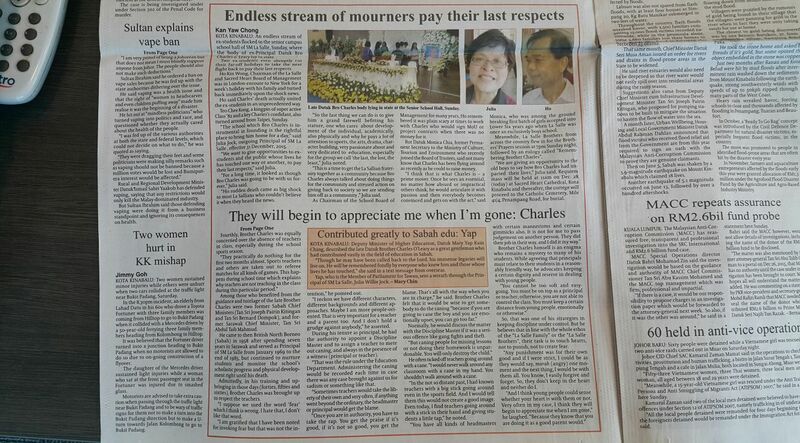 Charles’ top regret was no student of Sacred Heart or La Salle schools had the calling, thus far, to pursue what he dedicated as a vocation all his life, although there were Malaysians from other schools who had served under him when he was Principal of La Salle Secondary School like Bro. Yohan and Bro. Justin who was from Tambunan. He had hinted so to many people, including his students, but none seemed to have had the calling. Fr. Cosmos Lee, one of his students, who eulogised in the homily at the funeral of Bro. Charles, is among the few who became members of the clergy. Bro. Charles once jested that if La Salle brothers were allowed to get married, probably there would be more than a few from the La Sallian family who would take up the calling in health and poverty and devote their life to God in the service of education for the young. He had experienced the church’s trial and tribulation from the Usno era when the work permits of some foreign priests were not renewed and had to leave Sabah to the present challenges posed by extremist elements. After the fall of the Usno regime, the new Chief Minister of the Berjaya administration Tan Sri Harris Salleh arranged small part of the funding for the construction of the school senior block hall. Harris also lifted the Usno ban on Chinese cultural activities like unicorn and lion dances, which benefited the school as the renowned La Salle Lion Dance Troupe raised funds from performances for the construction of the school’s senior block canteen first besides others. 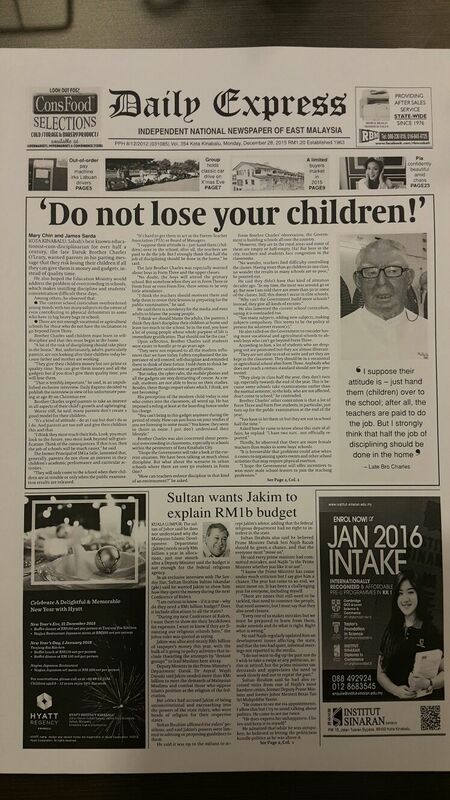 In many ways, the fear felt by some complacent and ignorant Sabah civil servants for Harris’ inspection tours during the Berjaya regime was what La Salle School students felt under Bro. Charles’ watchful eyes. It may be that being the non-populist example of Bro. Charles as an educationist exemplar is too hard to follow for the younger generations. But the challenge is still open for Sabahans to consider the La Salle Order as a life vocation in the service of our youths. Following are some of the late Bro. Charles’ sayings: “Stars shine and they show the way to safety, security and maturity, and that is the work of teachers whose vocation is to touch and form minds and hearts. I wanted to be a star with a small ‘s’ no doubt, so that I could and can form and mould young minds and hearts and prepare them for life both here and hereafter.